Why do we have this page? This page is dedicated to all of those dogs in the world who have been neglected, abused, unwanted, and/or ignored but who have risen above those low (or lack of) expectations and gone on to do truly amazing and heroic things. These dogs lay testament to the fact that rescue dogs are FAR from defective or inferior to other "normal" dogs bought from pet stores or breeders. We at MAGSR love each and every single one of our dogs. Each of them is great in their own way. These dogs below however, have that extra something that show the true greatness behind the beloved GSD and rescued GSDs in particular. If you have a similar story about your rescue dog doing great things (it need not be K-9 work!) please submit your story here. We get wonderful stories all the time but now we plan to share them with others. If you send a picture with it, we may even post it on our site so that others who doubt the greatness of rescue dogs can see just how much of a "hero" they can all be! CLICK HERE FOR INFORMATION ON MORE SPECIALIZED TRAINING SUCH AS SEARCH AND RESCUE, AGILITY, ETC. loneliness of the night closes in, I will be at your side. voice, - is all that is needed for me to unselfishly give my life. that each day at your side is my reward. together, their envy will be measured by their true respect for us. me with kind thoughts and tales. Our time together was unbeatable. If we should meet again on another street, I will take up your fight. I am a Police Working Dog. Together, - we are guardians of the night. Moscow came to his forever home on April 2006. We knew some adjustment would be necessary for not only him but also for me. We went to Basic and Advanced Obedience and eventually AKC/CGC Certification. Through all of these sessions we developed a stronger and stronger bond, though neither Moscow nor myself felt compelled to succeed; we simply enjoyed our time together. He was eventually approved by Pets on Wheels as a Therapy Canine. His success was the result of our FAITH in each other. We continued to work together and the result of the CHARITY as a service canine he touched the lives of many giving HOPE. Once on an outing he was approached by a woman who asked if her brother could pet him. Her brother was in a wheel chair and was not responsive to his surroundings. Moscow was given his command "Sugar" and he immediately went ever so gently to lift the mans hand with his head. At that moment the man responded and began to pet him and smile. This continued for some time and the woman was elated and began to cry for her brother as he was not responsive to anything. Though he is now retired he continues to work at his trade. Over our time together Moscow has introduced many to a new world one without conditions; one of miracles and hero's. Together we know the meaning of FAITH (in each other); HOPE (that he has given others) and CHARITY (his giving of himself). I adopted a GSD named Astro just about 2 years ago from you. He will be 3 Years old on May 25th. I have to tell you I do not know where I would be without him. I have always been an “animal” person and understand the needs of a GSD. But this one seems to know my needs better than I do. I have had a rough time the past 4 years with Illness and the loss of a young daughter. There have been times when I thought I would fall apart but Astro seems to know when that is and always does something to distract me from the pain or my thoughts. We have bonded better than any dog I have ever had and I am 55 and haven’t been without a dog since I was 3. To Me Astro is a genuine hero and a champion. When I got him he was a scrawny 7 month old pup... No believe it or not he is 150 lbs (The Vet said he’s not overweight just huge) of beautiful GSD one of the biggest I have ever earned and he is as sweet as he is big. Not to say he wouldn’t protect me because I know he would. It just shows you what a little time and patience can do for a dog. 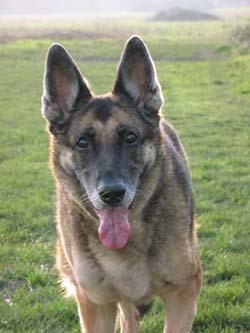 Just a short story of my GSD Sheba aged 12 yrs. She is a rescue dog from the famous Battersea dogs home in England. She does not work, she is my companion dog, and boy what a companion. The first day I saw her I was told that she was very vocal and not to put my hand through her kennel. Well when I approached and called her, she came, no barking, just tail wagging, I spoke gently to her and she put her paw through the bars and looked deep into my eyes. 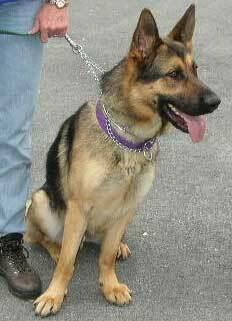 Sheba had been in several homes until she met me, through no fault of her own. I was suffering from depression at the time and we both rescued each other on that day.From that point on she was my dog. I am very happy now and we both live life to the full. We have been together for 7 years now and she is my friend and protector. I love her dearly. She looks out for me on the streets of London and has seen off a few undesirables in her time. 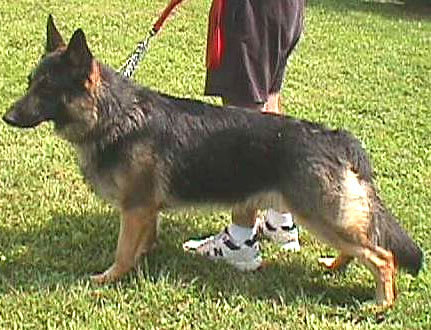 I will not have any other breed of dog as for me none can match the GSD. She is my unsung HERO. Frazier came to us from a kill shelter in West Virginia. He had been adopted out but brought back for being "too big for the house." Well, as it turns out Frazier likely was too big but not in the way you might have thought. He just had LOTS of energy and drive - so needed way more than a sedentary life at home. When we got Frazier in he was immediately impressive. He's gorgeous first of all but he never stopped moving. He was always in motion and would bark to entertain himself. It was obvious that Frazier would need at a minimum a very active home. After Frazier attended one training session with one of our trainers (Wesley Jenson) however I got a call that same day. Wes wanted me to adopt Frazier saying how impressed he was with Frazier and how Frazier really needed "a job", which meant at least an owner who would be someone who not only wanted to do some real work with their dog but someone who was capable of that kind of commitment. Well, I had just lost my male GSD and simply was not ready for it yet. It turns out that was a good thing for the Maryland State Police (MSP) however...as he's now joined their ranks for the March 2006 class of K9 detection dogs! Frazier was the number one recruited dog from all the dogs they evaluated! We'll keep you posted but given how much Frazier excelled and how much he obviously loved the excitement and challenge of real working dog tasks - we are sure he'll pass with flying colors! UPDATE 6/20/07: Fraizer just graduated in December from narcotics school. I got a call from the Trooper who is Frazier's partner, Frazier just got a $10,000.00 seizure from a car search. Frazier is a narcotics dog and has had his share of drug finds but his was his first hit on money. The "bad guy" had touched this money with traces of drugs on his/her hands leaving that scent on money. The money was hidden in different places on a car that was pulled over by a Maryland Trooper who called in Frazier and his partner. The craziest thing happened the other night. Coco (fka Kayla) started barking like crazy, she has been sleeping by the front door- and every so often folks walk by and she barks, that's normal. But at 3 am, she started going nuts. We wake up and look outside - see nothing. My husband walked downstairs to check her, and was going to let her out since he was up. Just as he was about to open the front door, I spotted a man standing out by the street, sort of hiding by our fence so I start yelling to him that someone was out there. We called the police, and there turned out to be 2 men, as we watched, break into a car parked in front of our house!! We aren't sure if they got anywhere near our house but judging by her reaction we are sure she scared them off either way. The cops came to take our statements and they searched for the 2 men the rest of the morning hours who found one of them...but it was Coco who was our hero!! Barnabus, better known to those who love him as Barnie, is our newest "Hero in Training". He is in training to be a medical security dog like our beloved Jagger two dogs down on this page! 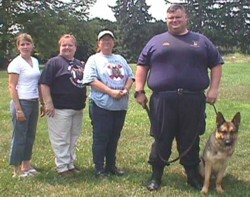 Barnie will be trained with the Mercy Medical Center's K-9 Unit. After training is complete, they are licensed through the Maryland State Police. We wish Barnie all our best and know he will do great! Shadow sat (not-so-patiently) in our kennel for over three months meeting family after family. He was always too much for them. We soon realized that it was because he needed more than a new home - he needed a serious job! Shadow was just too smart and too driven for a life on a couch or even a simple back yard! 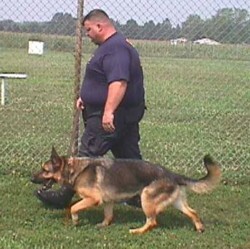 He was evaluated by 3 K9 trainers from the Department of Corrections. They were so impressed with him that they were arguing over who would get to be Shadow's handler once he was trained! He recently completed his training at the police academy, still a favorite of the trainers. He is now working the streets with his fellow human officers "serving and protecting" the lucky residents of Hagerstown...at least the law abiding citizens are lucky! If you see him around some day say hello for us all at MAGSR. Update: Shadow has finally completed his training with the academy. Shadow, the 'throw away' rescue dog who wasn't good enough for his first owner, is graduating at the very top of his class! His new handler now knows what we at MAGSR tell people all the time...that rescue dogs are the best dogs! Congratulations Shadow on your graduation - from everyone at MAGSR!! You have made us so proud!! 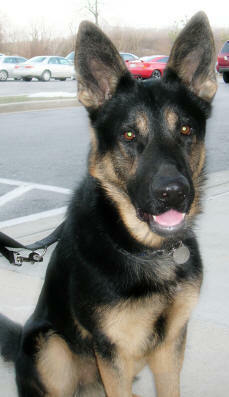 Jagger was with us a very short while before being recruited for K-9 work - no small feat in itself! Very few dogs can even make the cut to begin training for this kind of work. 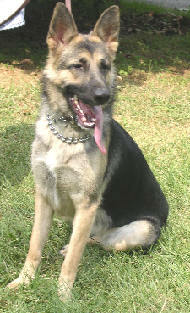 He will be trained with the Mercy Medical Center's K-9 Unit. After training is complete, they are licensed through the Maryland State Police. We wish Jagger the best of luck and know he will do well! Update: Jagger is doing well living the life of a working K-9 by day but residing in the lap of luxury by night. He's one of the lucky dogs in the world that gets to serve and protect working side-by-side with his new dad all day long and then getting to go home and play with his new family and just hang out and relax all night - almost never being alone. 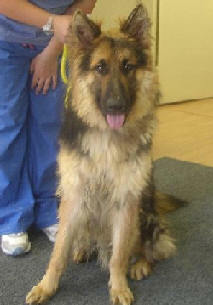 We wish Jagger the best of luck with his new family, new job, and new life!